My love for Quora has already been well documented, but for those of you who haven’t made the plunge to become full blown Quora addicts yet, I will share one of my answers from this morning. I think Dean Jackson has a wonderful perspective on this question. He says that one of his main goals is to “live like an artist with a $50,000 / month trust fund.” That way he could wake up every day and ask himself the question, “What would I like to do today?” and then focus on the thing that is most important to him for that day. The goal is to get to the point where you don’t have to work, but you ﻿want to work. 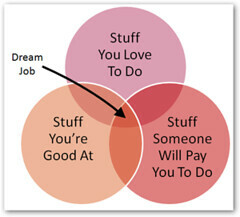 You want to work on things that you find incredibly rewarding and valuable. Most often this includes things that help others, improve something, make the world a better place, etc. When you get to that point where you are able to truly focus all of your time and attention on a project that motivates and inspires you — like an artist — that is when you will produce your best work. If you ever have a chance to watch the “New Money Masters” video with Dean Jackson and Tony Robbins, I would highly suggest it. I know it doesn’t answer the question of what I personally would do, but I think the point of this question is really to figure out what you would do. This answer and approach is definitely something I am working towards every single day.